Contest: “How My Savior Leads Me” by Terri Stellrecht | J.W. Wartick -"Always Have a Reason"
Recently, I reviewed How My Savior Leads Me by Terri Stellrecht. I now have the opportunity to host a free book giveaway in which one winner will be selected to receive a copy of the book. 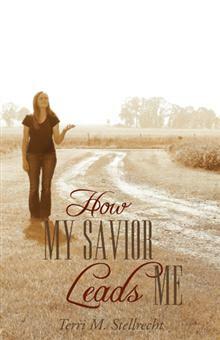 I highly encourage readers to check out the book and Terri’s site, How My Savior Leads Me. Those who wish to participate need only to post a question for the author of the book. The author and I will select a few questions for her to answer, and we will select the winning entry randomly from the total pool of questions selected. (All valid entries will have a chance to win, including those with questions not selected. )You Must Provide a Valid E-Mail Address To Be Selected As A Winner. Please note that only entries that ship to addresses within the Continental United States are eligible. Only one entry per person is allowed, but entrants can choose to enter more than one question should they desire. Well, read the review to get some insight into the book, or check out the handy “look inside” feature on Amazon! Or, if you’re feeling particularly lazy: it’s a book which beautifully reflects on the passing of Trent, Terri’s son. She focuses upon God’s sovereignty and his plan throughout it all and rejoices in the fact that Trent is saved in heaven. So, questions can be asked on anything from divine sovereignty to Christianity generally to personal questions about coping with the loss of a child. But for more, I’d suggest reading the review. Any entry deemed offensive will be deleted. The contest will be open through midnight, central time, on February 19th, 2012. The winner will be selected by February 26, 2012. This contest is being held at the sole discretion of J.W. Wartick and Terri Stellrecht. They reserve the right to cancel or amend the details of the contest in any way at any time. Specifically, they will not be held accountable if the book is lost in the mail; if an entry is missed; etc. In other words, this contest is in no way legally binding for any who participate. By submitting an entry, you agree to the stipulations and rules provided in this post. Terri, I like you have lost a lot in following Jesus; (and I don’t want to elaborate) I know myself; so I know I have ‘triggers’ those hot-buttons, (I’ll read something, or someone will make a cutting remark) and that will bring on pain and anger. I am trying when it ‘hits’ (and I know it is not God) to take the slow, deep breath, and remember how much Jesus loves me. (a kind of count to ten slowly)…and now I find that works. I am not ‘repressing’ the anger, but giving it to God.